A weekly event like none other in the Bay! 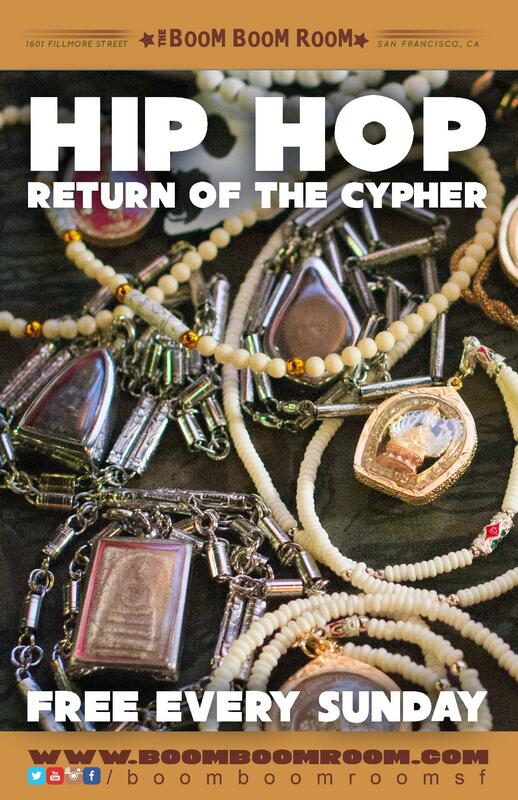 Return of the Cypher is a free live Hip-Hop show every Sunday at the Boom Boom Room that features amazing local freestyle artists taking the stage in improvised sessions, know as cyphers, where emcees, singers, beatboxers, and musicians collaborate in a spontaneous combustion of pure skill. Kevvy Kev rocks the wheels of steel with B-Boy and B-Girl Cyphers and Bottom Hammer holds down the classic jams for the freestyle emcees! A legendary talent in the Bay Area, Kev has been rocking the decks for everyone from Wu-Tang to Camp Lo to DAS EFX and the list goes on. He is a true connoisseur of Hip Hop jams, a master of the art form of dejaying, and the host of the longest running Hip-Hop radio show of all time, The Drum, on KZSU. THIS SHOW is always FREEEEEEEEEE Admission !